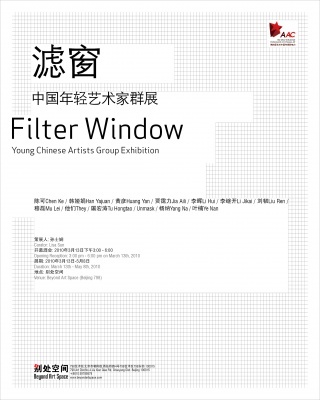 At 3:00 pm on March 13th 2010, Filter Window – Young Chinese Artists Group Exhibition will be held at Beyond Art Space in Beijing. All the artists of this exhibition were born in the 70’s or 80’s. China was experiencing a radical change and was opening-up when the artists grew up. The one-child policy, reforms, the rapid economic development and the adoption of the best international practices have made China an integral part of the worldwide globalization. Foreign culture and new ideas have had a significant impact on the minds of the young people. Material abundance, urbanization, information technology and social development have all been reflected in the works of the young artists. With a proper filtering technique, they associate the information and change it into a language of art in which they create a unique spiritual world. The expression of Filter Window is derived from a medical term and is then used as the name of a kind of virus filtering technology for a computer network. The exhibition borrows the term mainly for two reasons. Firstly, the artists have been selectively chosen according to their ages; secondly, the artists filter what they see from their surroundings and form unique perspectives of the world. Chen Ke’s works reflect her memory of growing up and Li Jikai creates works with meditation. They tend to attach more importance to the spiritual world. The works of Yang Na and Han Yajuan vividly represent the young girls’ way of living. Mu Lei’s works represent the artist’s attitude towards foreign culture. Jia Aili depicts his real feeling about the reality on his canvas. Liu Ren creates a private dream world based on her life experience. UNMASK creates a closed fantasy world which is free from the influence of outside. Li Hui’s works have a tremendous visual impact on their audience because of their dazzling colors and embodiment of eastern culture. Huang Yan gets his inspiration from the classical Chinese books, the indifference of contemporary life and situations to symbolize the spiritual world of the human.Tu Hongtao constructs a stage with urbanization as the background. The works of THEY fully represent the impact of globalization. Ye Nan’s works indicate his curiosity and acceptance towards new things. Through the works of these representative artists we can see anxiety, pain, passion, the sentiment of the artists in current times, their attitude towards the outside world and the changes they faced.